Banks could be more transparent about their climate progress. Flickr/Daniel Foster. The financial sector is increasingly aware  of the need to shift capital flows away from companies and activities that contribute to the climate problem and into climate solutions. However, they are just getting started in thinking through and strategizing on how best to respond—and tracking the climate progress of financial institutions has proven notoriously challenging. Are banks moving their financing in the right direction? It's a very tough question to answer. Our analysis of 35 large development and commercial banks  found that, by and large, banks are unable to convey their overall climate progress. Many that report on climate-friendly "green" investments, for instance, do not fill in the other half of the picture by also reporting on financing of activities and technologies that contribute significantly to GHG emissions, known as "brown" investments. Until we know a financial institution's contribution to the climate problem as well as their contribution to the climate solution, claims of climate progress can only be assessed as incomplete. Banks—like any other financial institutions and businesses—are interested in taking advantage of the new business opportunities afforded by the low-carbon transition, through financing of sectors such as sustainable transportation and renewable energy. The world needs an additional $1 trillion per year , on average, investment in clean energy through 2050 to limit global temperature rise to no more than 2 degrees Celsius. Financial regulators are also increasingly concerned about risks to the financial system posed by climate-related threats. The Financial Stability Board's recommendations for effective disclosure of climate-related financial risks and opportunities is ushering in a new phase in norms and expectations around the issue of financial institutions' climate-related disclosure. In response, some financial institutions—including banks—are moving with speed and determination to understand, assess and disclose such climate-related risks, as shown by a recent UNEPFI-convened group of 16 banks piloting the recommendations and delivering the first publicly available methods  for the industry to do so. Some existing metrics are useful, but are bound by important limitations. For example, "financed emissions" accounting uses emissions as a metric to track portfolio level responsibility for GHG emissions. Assessing climate progress with financed emissions enables one metric to be used across asset classes and is a metric of interest to some stakeholders to understand overall exposure to emissions. On the other hand, this level of aggregation may provide fewer insights for internal decision-making than sector-specific metrics which cannot be aggregated across asset classes, such as measures of efficiency for real estate (kilowatt-hours per square foot) or vehicles (miles per gallon). Many banks have made commitments to finance climate solutions, known as "green" finance. For example, the Australia and New Zealand Banking Group stated in 2015 that it will fund and facilitate at least $10 billion by 2020 to support increased energy efficiency in industry, low-emissions transport, green buildings, reforestation, renewable energy and battery storage, emerging technologies (such as CCS) and climate change adaptation measures. Conversely, a few banks are tracking and shedding their financing of climate problems, known as "brown" finance. For example, the World Bank announced it will stop financing oil and gas exploration and extraction from 2019. Green and brown exposure metrics have some limitations; it can be difficult to find agreement on whether controversial technologies like natural gas, nuclear, CCS and biofuels are "green" or "brown." 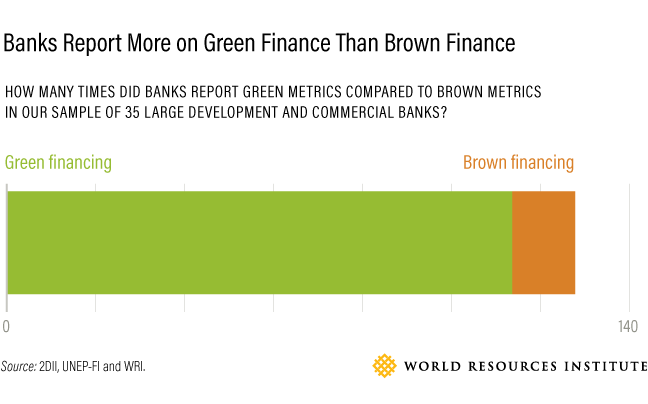 However, if green and brown exposure were transparently reported by banks, it would improve the understanding the financial sector's climate progress. Some financial institutions are already taking concrete steps to improve their climate progress. In December 2017, the World Bank, ING and AXA announced plans to divest from fossil fuels including coal, oil, and gas. Earlier this year, Spain's second largest bank BBVA committed to invest €100 billion ($119 billion) in climate projects by 2025 and cut its own carbon emissions by 68 percent. To truly bring the climate fight to finance, however, requires developing science-based metrics and tools that allow financial institutions to set performance benchmarks in line with global climate goals. The Science Based Targets initiative is working to develop methods and guidance for financial institutions to set science-based climate targets  for their investing and lending portfolios.